The "SECRET POSSESSIONS" Collection at Primark is a lovely collection of luxury lingerie and pyjamas in silky textured materials, trimmed with lace or embroidery. 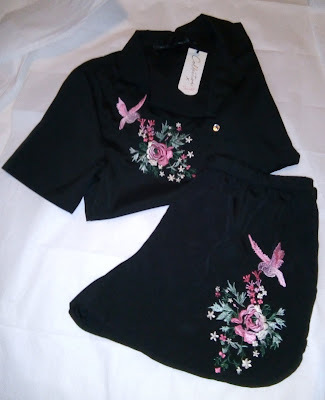 I fell for these black pyjamas as soon as I saw them! Made in a polyester fabric with a silky feel, the short-sleeved jacket and matching shorts are both very prettily embroidered on opposite sides. The label, "SECRET POSSESSIONS", makes me think of those little items that are personal, precious and treasured and kept carefully in the drawer wrapped in tissue! Here are two more pieces that could fall into that category. Made with removable insert pads, it is ideal under clothes that look and feel better with a natural shaped bra, rather than a "structured" look. For me, M&S is the place to go for knickers that feel soft, silky, luxurious and comfortable. These beautiful lacy Shorts are from the Sophia Lace Collection of lingerie, which also includes bras, Brazilians and High Leg Knickers. NOW HERE'S ANOTHER TYPE OF SECRET! We've all known those mornings when the weather has suddenly turned warm and sunny and those black opaque tights just don't seem right. Our legs are looking unattractively white and there just isn't time for the self-tanning operation. Some of us are not confident anyway about wearing short skirts with bare legs. To many the idea of wearing sheer natural or tan tights seems very retro and dates back to an era when a lady only went bare legged at the "seaside". I would like to make a case for sheer tights because apart from adding colour, they also give coverage for small defects, firm up flabby bits and give legs a smooth, even finish. It is important to get the shade and texture right. Semi Shiny 20 denier tights in Tan from H&M. These 20 denier tights give good coverage if needed and a smooth appearance, but 7 or 10 denier tights can be really undetectable and give a convincingly bare leg look. Bare Cooling Ladder Resist Sheer Ankle Highs 7 Denier Appearance in Natural Tan from M&S Autograph. What I really like about these socks is that they come up higher than most sheer ankle socks and so are ideal for wearing with jeans or leggings that sit just above the ankle bone. Also, they have sheer toes. DARK GLASSES were once associated with secrecy, mystery, "Film Noir" characters and Hollywood stars seeking anonymity. Now, not only have they become a key fashion accessory, we are also now more aware of the need to protect eyes from the sun. 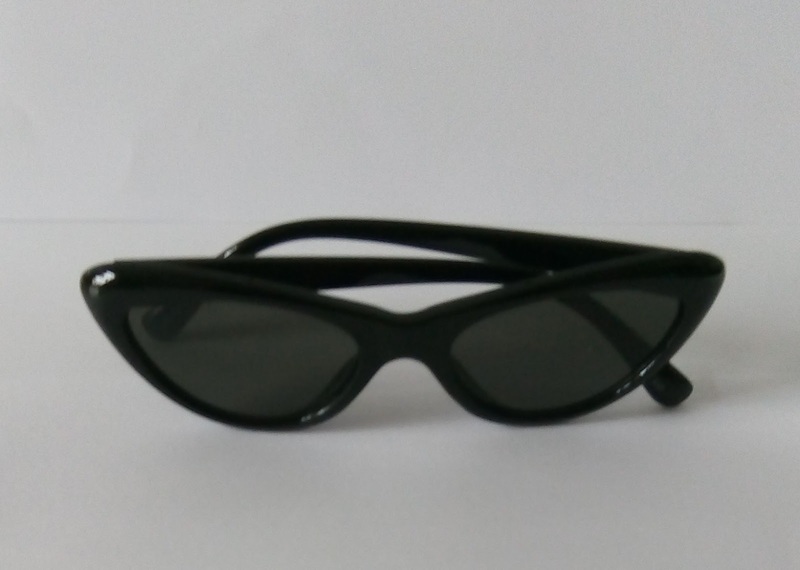 Recently I have been wearing my aviators with rose gold lenses but this season I have opted for trendy, sleek, Cat Eye sunglasses from Urban Outfitters with dark tinted lenses and glossy black plastic frames. It's very sunny out today!